PXLPLAY™ animated LED play walls change color and respond to human touch. Shoppings centers and child-friendly businesses can now be at the forefront of digital innovation and install the entertaining PXLPLAY play wall at their indoor play areas. Indoor play area at Greensborough Plaza, a shopping center in Victoria Australia, owned by the Blackstone Group. Kids, parents and friends can take turns or simultaneously touch the PXLPLAY interactive play wall to make fascinating, dynamic mood lights. PXLPLAY™ is a wall-mounted, interactive LED lighting system that responds to human touch by changing color, brightness and patterns. PLAYTIME™ is excited add the new PXLPLAY interactive play panels to its world-famous, custom-themed play area line of products. PXLPLAY features an intuitive interface with a network of full-spectrum LEDs (light-emitting diodes), sensors, and a variety of animated light games and program sequences. Players can choose to games like ‘color block’, ‘simon sez’, ‘snake attack’, ‘star burst’, ‘super tag’ and ‘game name’. PXLPLAY games are easy to play and require no special instruction. Kids, parents and friends can take turns or simultaneously touch the wall to make fascinating, dynamic mood lights. Users thrill at generating surprising and delightful light displays and bio-responsive gaming. Digital signage technologies first appeared in shopping centers in the late 1990s with the advent of the Internet. In the last five years, interactive digital LED wall panels have been put in use in airports, stadiums and other public spaces. Today, digital signage is fast becoming an industry standard for retail, restaurants, hotels, health & fitness centers, universities, hospitals, churches, offices and mixed-use commercial and residential developments. With PXLPLAY, PLAYTIME takes digital signage to a new frontier: digital wall entertainment. PXLPLAY’s illuminated surface is ideal for creating dramatic and truly interactive architectural environments that meet today’s modern design expectations. 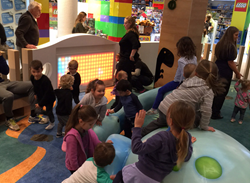 Shopping centers and retailers can now be at the forefront of digital innovation and install the entertaining PXLPLAY play wall feature, where families can stop and engage with a variety of responsive light games. Fast growing in popularity, PXLPLAY interactive play panels are in high demand for ‘exergaming’ for little kids. PXLPLAY play walls let kids combine cognitive tasks with personal motor skills, making them a practical and attractive choice for family entertainment centers, health and fitness centers, and childcare centers. PXLPLAY play wall system is simple to operate, totally self-contained and mounts to any hard surface. Each 3’ x 5’ standalone system comes with a selection of games and requires no external controllers or computers. PXLPLAY™ operates on a 110 VAC outlet. The highly durable housing is manufactured from thermoformed plastic that is easy to clean and maintain. PLAYTIME LLC is the global provider of unique, custom-themed indoor, outdoor and water play areas and playground equipment based in Englewood, Colorado. Our commercial playground equipment and themed soft play areas are designed to engage children, drive traffic and enhance our customers’ brands. Thousands of families EXPERIENCE PLAYTIME everyday at malls, restaurants, airports, stadiums, childcare centers, healthcare centers, fitness centers, churches, resorts and recreation centers, water parks, and museums – any place that kids and toddlers play. Visit http://www.playtime.com.